I am an applied mathematician working on theory and applications in ecology and evolutionary biology. The underlying principle of my research is to identify and model processes on the molecular and/or individual level from which population and evolutionary behaviour is derived and analysed. The essential component of my modelling philosophy comes from the realisation that changes in the demographic state of the population affects the selection pressure on the individual level, leading to so-called eco-evolutionary feedback loops. My work consists of three interacting layers (see Figure at the bottom). 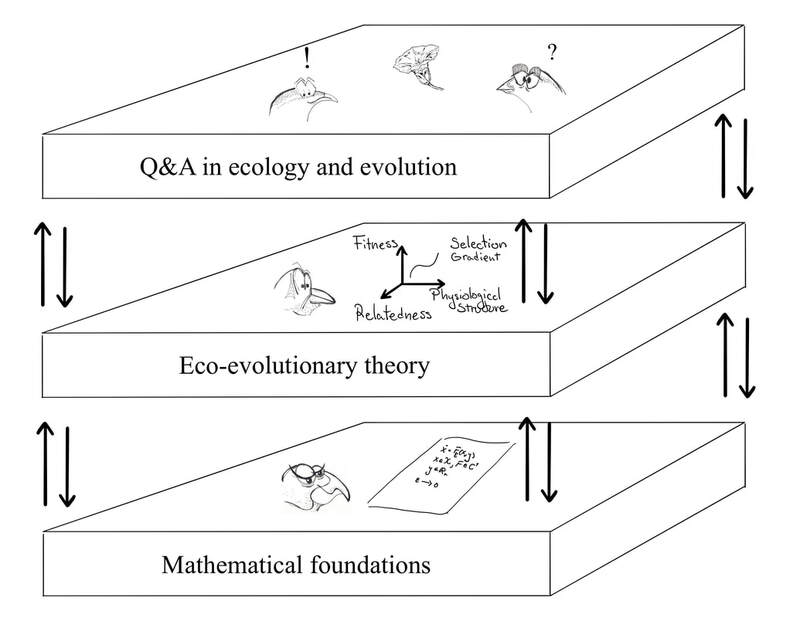 The top layer represents the various questions and hypothesis in ecology and evolutionary biology that I am fascinated by. I am in particular interested, and have worked on, (i) local adaptation and speciation, (ii) the evolution of cooperation, and (iii) the evolution of genomic architecture in self-incompatibility haplotypes in plants. The middle layer consists of the development of the modelling framework that enables the analysis of the biological questions posed in the top layer. Special attention is given to the partitioning of eco-evolutionary models in such a way that allows the description of the relative effects of selection, drift, mutation and migration on the evolutionary process. This work includes clarifying theoretical concepts such as reproductive values in physiologically structured populations, and identity measures in eco-evolutionary spatially structured populations. The bottom layer lays out the mathematical foundation necessary in tackling the questions in the above two layers. The focus is on developing timescale separation methods that allow the coupling of ecological and evolutionary processes in general structured population models. This requires research on invariant manifolds in Banach spaces, geometric singular perturbation methods and on stochastic processes such as coalescence.